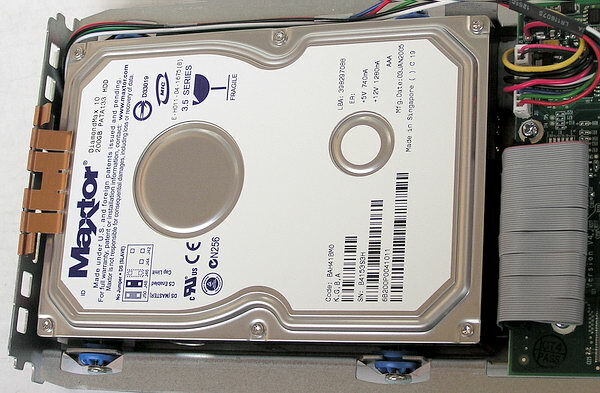 To all appearances, the idea of standalone storage drives has solidly captured the minds of computer periphery manufacturers — the pioneer shared hard drive NetDisk NDU10-120 from Ximeta was followed by a number of similar products, including the nearly "wire free" ASUS WL-HDD2.5. 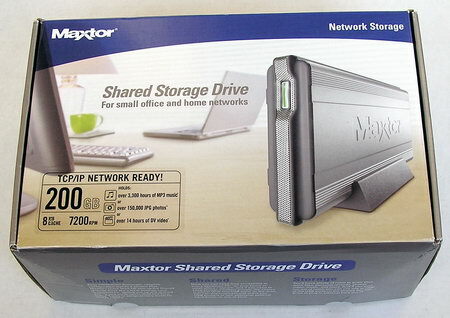 The fashion has been finally taken up by HDD manufacturers, who are confidently mastering allied external storage drive markets: Having earned much experience in the area of external storage drives, Maxtor presented two models of network (in Maxtor terms — Shared Storage Drive) storage drives — the 200 GB H01P200 and the 300 GB H01R300. We obtained the junior model — H01P200. The case of this storage device is of impressive dimensions and weight. 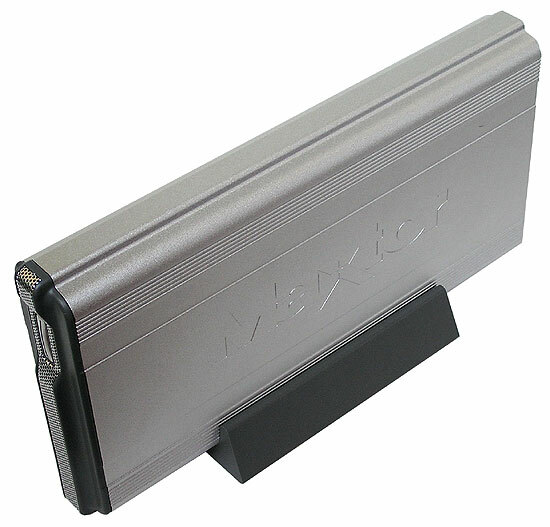 It's much longer (27 cm) than the cases of USB storage drives Maxtor OneTouch II, though it's also made of thick duralumin profile, which is good at protecting the innards and channeling the heat away. 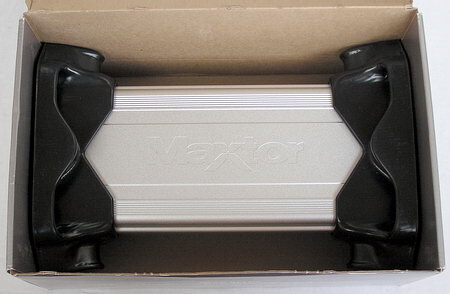 Case orientation may be traditionally horizontal (sticky rubber feet are included into the bundle) or vertical, on a plastic stand (see the photo above). 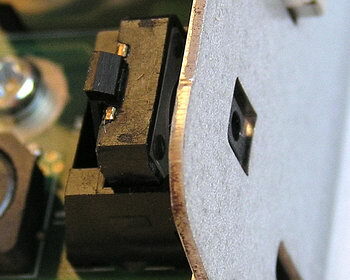 There is a power button on the front panel, which also acts as a yellow-green status indicator. 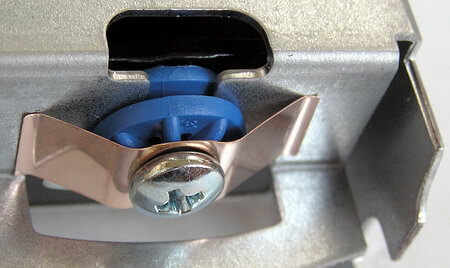 Kensington lock can be mounted on the thick metal rear panel as well. 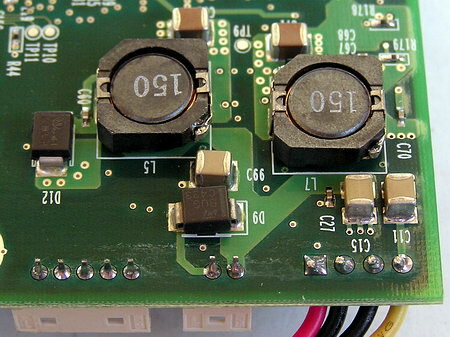 The storage drive requires +12 V DC, up to 3 A, so the bundle includes a proper PSU (quite compact at that). There is a Lithium battery inside the storage drive, which maintains device settings, even if there is no external power. The insides of Maxtor Shared Storage Drive look imposing. Now you understand why this Maxtor is longer than other models with USB and FireWire. which dictates a longer case. 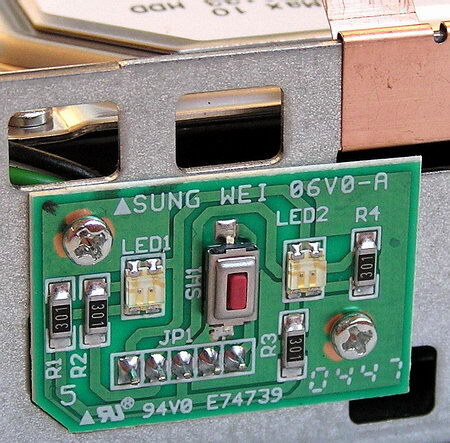 There is a small PCB with a control button and two LEDs on the inside of the front panel — constant or blinking green and yellow lights help distinguish normal operation, on/off status, and problems with the network interface. 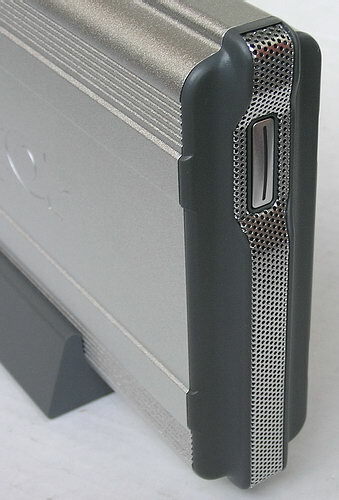 There is a fan on the rear panel (which is often not installed on the OneTouch series). This is not at all out of place here, considering the 7200 rpm hard drive inside. Technical characteristics of Maxtor shared storage drives are published in Table 1. 2 x USB 2.0 to connect to USB printers, external hard drives, and flash drives. The picture below explains possible applications of the Maxtor product. Being connected to the network hub (it can also be connected to a computer directly), it allows to plug two external drives and/or printers to its USB ports (of course Maxtor recommends its OneTouch/OneTouch II :)). Besides, the shared drive itself also becomes available in the network. 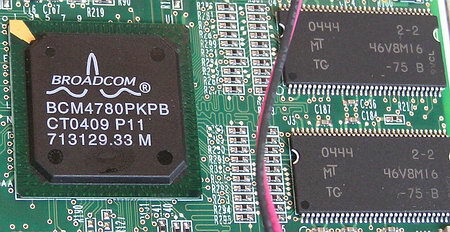 The H01P200 also supports flash drives. 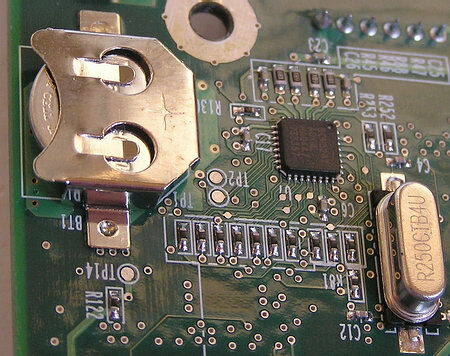 However, you cannot connect an USB hub to the H01P200 in order to increase the number of connected devices. 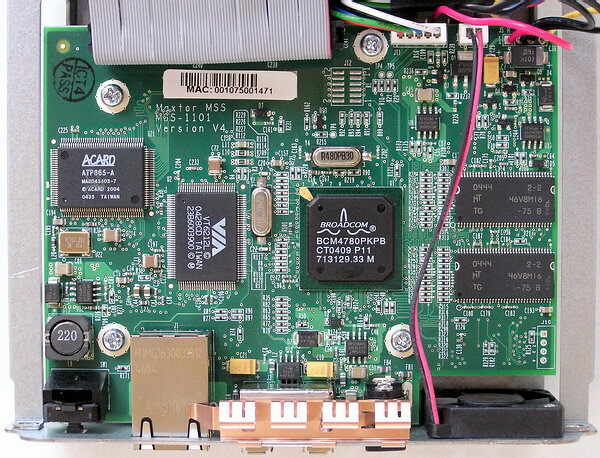 You will have to install a control utility from the Quick Start CD, in order to start working with the H01P200 after it's connected to your LAN and powered. After that, there will appear two icons on desktop: Maxtor Quick Start for managing the shared storage drive and the link to the H01P200 itself (see the picture). When you start Maxtor Quick Start, the main screen of the utility opens up. Here we can make sure that the shared storage drive with Network ID MSS-001471 is really available in the network at IP 169.254.170.8 and we can start administrating it (see the picture). Now we get to a nice and coherent start page of the administrative web-interface. Let's start from Run Setup Wizard and proceed in order: we can configure the language (forget about the Russian), date and time in the standard format in our parts, the name and workgroup (Cyrillic is again out of the question) for the shared storage drive, as well as an administrator password (see the screenshots). System Status displays the current system status. H01P200 is detected as a computer (by default it's part of Mshome workgroup) with several shared folders (see the picture). Consequently, all file operations can be performed in standard Windows Explorer or in any file manager you like. But we suffer from national discrimination — Maxtor drive feels free to handle Cyrillic in folder and file names as it pleases it. For example, it displays trashed Cyrillic file names in a flash drive. When the files with Cyrillic names are copied to a flash drive, they seem to retain their original names, but when connected to USB of a regular computer, you'll find out that their names are actually damaged. 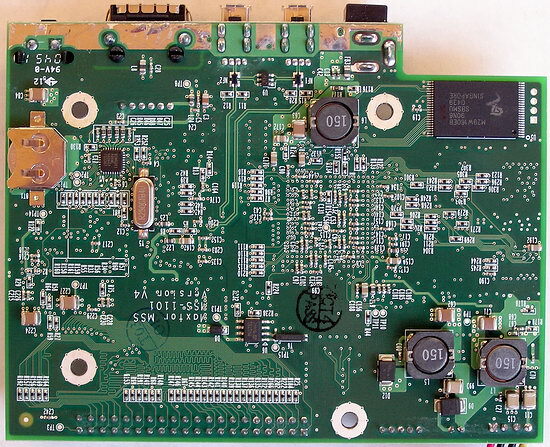 Let's hope that this disgrace will be fixed in the next firmware. In our case Burchik (see the previous picture) is a folder, which was automatically created and named after a Windows user, with the following contents. Such a favor from Maxtor (coherent automatic folder structure) is not without purpose — the proprietary Drag and Sort function will sort all the files you drag on the icon of your drive (e.g. on desktop) automatically into folders (over hundred formats are supported). If you find this function too obtrusive, you may easily disable it by choosing the corresponding menu option in Maxtor Quick Start utility. 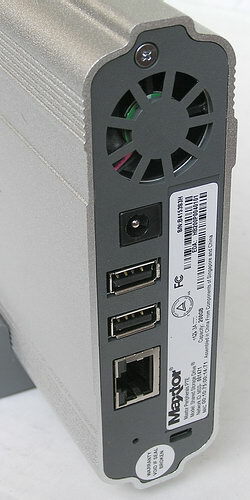 Though Quick Start CD contains only Windows utilities, the H01P200 can be operated under any operating system with SAMBA and TCP/IP protocol stack. But Drag and Sort will be available only to Windows users, if they installed Quick Start. Then, config contains a link that sends us to the reviewed administrative web-interface of the shared storage drive. New Volume and NTFS belong to two partitions on the external USB drive Seagate, attached to the H01P200. The first partition is formatted to FAT32, the second — to NTFS. Like other similar products, sterling operation is possible only with FAT partitions (! ), while NTFS partitions are open only for reading. Printers and Faxes display printers, connected to the H01P200. In order to objectively evaluate how well Maxtor H01P200 copes with its tasks, we shall use two HDD test utilities that allow shared storage drives — Intel IOMeter and FC-Test. We used the following configuration in our testbed: Gigabyte GA-8GPNXP Duo motherboard with Intel Pentium 4 540 (Prescott 3.2 Hz), 1 GB DDR2-533, 200 GB HDD Seagate ST3200826A. 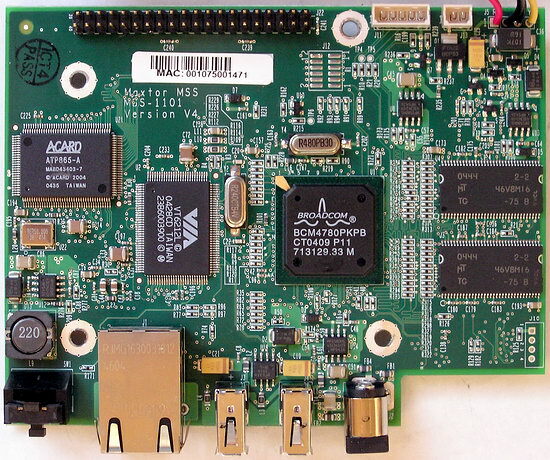 We connected the H01P200 drive directly to one of the gigabit network controllers of the GA-8GPNXP Duo motherboard. 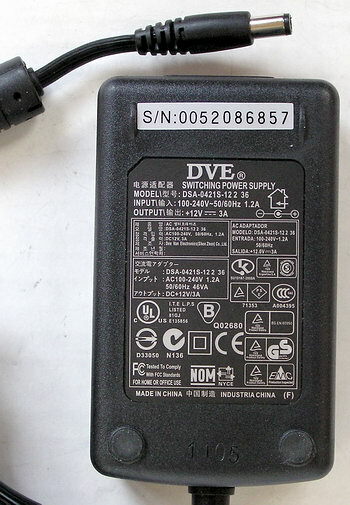 Besides, we connected an external 100 GB 2.5-inch Seagate Portable ST9100801U2 drive to one of the USB ports of the external Maxtor drive in order to repeat the entire series of tests and evaluate the H01P200 network interface performance in this aspect. We also publish the results of another shared storage drive — ASUS WL-HDD2.5, which works via the 100 Mbit/s LAN interface. Measurements of various load patterns are published in the diagrams. Sequential reading performance tests demonstrate that the maximum throughput of the Maxtor H01P200 storage drive is 5-10 times as low as in modern 3.5- and 2.5-inch hard drives. At the same time, compared to the shared drive ASUS WL-HDD2.5, which works with wireline network interface, the Maxtor's performance is several times as high; it's very close to the practical maximum of a 100-Mbit link. Even when the USB storage drive is connected, the network interface does not slow down much, that is Maxtor H01P200 works very fast as a USB hub. But the sequential write rate turns out several times lower compared to reading. But it's noticeably better than the shared storage drive from ASUS anyway. 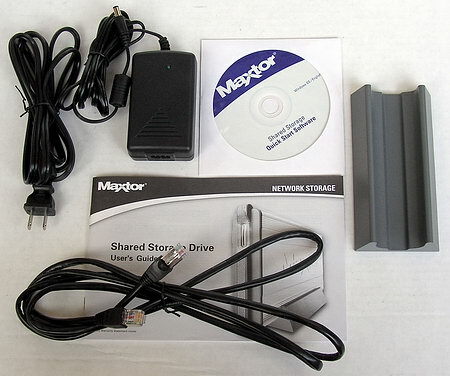 On the whole, the Maxtor shared storage drive is much better at reading than at writing. However, the synthetic sequential read/write rate is not the most important characteristic of a storage drive. What's more important is file operation rates - reading, writing, copying, and other everyday operations. 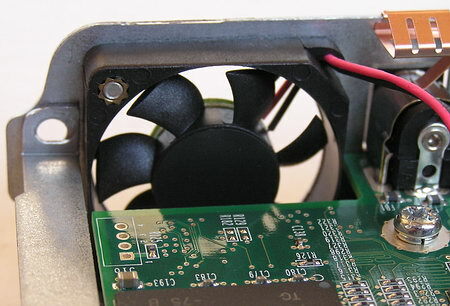 We shall imitate them in Intel IOMeter with special patterns for large and small files separately. In this case we used random access. It turns out that the read rate of large (~0.5 MB) files at random addresses is not that low here — about 3 MB/s. When reading files from a storage drive connected to the Maxtor drive via USB 2.0, it drops just to 2 MB/s. Even in case of small files, the read rate turns out almost the same, which is good news. 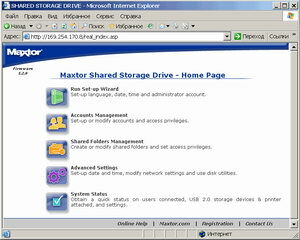 That is we are again convinced that the shared storage drive Maxtor H01P200 is good at reading files. However, performance of the shared storage drive drops when it writes files — below 1 MB/s both for large and small files. This should certainly be taken into account, when you choose a work profile for these devices. Copying large files inside the shared storage drive demonstrates a good rate — obviously better than in the shared storage drive from ASUS. However, reading small files grows slower with the increase of internal latency, when USB is used. That's about the same in case of archiving and extracting files within the drive. Thus, even the fast shared storage drive Maxtor H01P200 does not qualify for a regular desktop HDD job — its performance is too low in this case. It's main application is to store files for reading from it, more seldom it can be used for writing files to it. 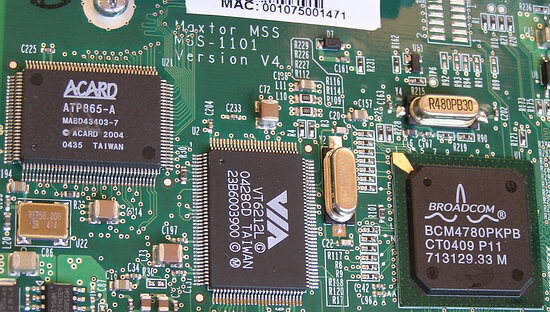 As the Maxtor H01P200 can be used as a small file server, a local database, or something like it, we are interested in patterns, which imitate operations as part of a server. We use DataBase, File Server and Web Server patterns for this purpose. Let's start with averaged data on the three server patterns and four queue depths (1, 4, 16, and 64). The data was averaged without weight coefficients. You can see that the network "server" on the desktop storage drive offers quite acceptable (for devices of this class) performance, while using its USB interface in these cases is undesirable. Each pattern result just backs up these conclusions. If the shared drive is used as a streaming data server (e.g., audio and video), it's quite another matter. Its performance leaps up here (up to 4-5 MB/s), which makes the Maxtor shared storage drive quite attractive. In conclusion, let's have a look at the defragmentation rate of the shared storage drive by the operating system on an external computer (it may be required in some cases). The Maxtor shared storage drive demonstrates good performance here as well, the ASUS WL-HDD2.5 with the same interface is outperformed by many times. As Maxtor H01P200 performance in various patterns of synthetic Intel IOMeter turned out not very impressive (though not that low as in ASUS WL-HDD2.5), we decided to be on the safe side and test the storage drive performance for copying files — to be more exact, writing and reading files. For this purpose we again used FC-Test 1.0, as in the last case with the ASUSTeK shared storage drive. Our choice of FC-Test patterns was governed by the estimated usage of the shared storage drive for writing and reading archives, backups, and multimedia files. We tried to squeeze maximum performance from this drive by using large files. Hence the following test sets — ten 700 MB files and 900 5 MB files. Our readings are published in Table 2. As you can see, reading from the shared hard drive is really significantly faster than writing, though the difference is lower than in IOmeter patterns. When Maxtor provides access to the connected Seagate USB drive, performance drops by 25% and 40% correspondingly. What concerns absolute read/write rates, they roughly correspond to the values obtained in IOMeter. Of course, they are several times as high as in the "light-weight" ASUS 802.11g WL-HDD2.5 via the same interface, but they are still a tad lower than in the earlier Ximeta NetDisk NDU10-120 (see the links at the beginning of the article). It goes without saying that Maxtor has not just "checked in" to the new sector. It designed a very good and high-performance product. At least it loads 100 Mbit Ethernet heavily. The H01P200 support for USB printers comes in handy. But you should admit that its support for external hard drives and flash drives is conceptual rather than really necessary. But this product will not manage to go away "clean" — traditional (for such devices) problems with Cyrillic in all aspects (some of them will be hopefully fixed in the next firmware versions), imposing dimensions, no wireless interface (it's high time to introduce it) and/or a simple router, impossibility to reserve the contents of USB devices on the shared storage drive by pressing its button, impossibility to connect the H01P200 to a computer via USB 2.0/FireWire. The last complaint looks rather strange, especially considering the price exceeding $350 (at the time of this article) — that's the cost of a sterling (even if the simplest) system unit with the same hard drive. A noticeable price drop (twofold ;)) is also one of our wishes. And finally, we express a weak hope that the manufacturer will sometime offer Gigabit Ethernet — it pains to look at the 7200 rpm 300 GB (H01R300) beauty with 16 MB buffer, sidelined with 100 Mbit/s. It actually uses one fifth of its real performance at best.